I was afraid that this would happen. Society once again manages to the lowest common denominator. Weeks after an idiot ignored warnings and her own abilities when she decided to get herself killed by riding the fence at Princess Juliana, it appears that she has ruined it for everyone else. In a story posted by the ‘St. Maarten News Network‘, plans are being formulated to re-route traffic and make it impossible for tourists and aviation fans to enjoy a pastime that has been in place for decades. The plan seems to entail rerouting vehicle traffic as well as to move the fencing much further away from the base of the runway, preventing thrill-seekers from hanging on to the fence when a 747 spools up her engines for take off. I understand that the loss of life might be tragic to the friends and families of the deceased, but why go to the lengths of ruining it for everyone else just because ONE person decided to not pay attention to warnings, or did not know her own capabilities. Once again, instead of finding a solution that satisfies everyone, lets just manage to societies lowest common denominator and protect all those fragile snowflakes from themselves. Why not just ban cars since people die in them all the time? Airplanes? yep, ban them too. While they’re at it, why not just pave the damn beach at the base of the runway and turn it into a parking lot. You never know when a 747 will touchdown a bit early and plow through a bunch of beach-going bystanders. Might as well plan for that risk now. Almost anyone with a passion for aviation knows about Princess Juliana Airport located on the Dutch side of St. Maarten. Most ‘avgeeks’ see it as a bucket list destination due to the fact that your are literally standing beneath aircraft that are only a few yards overhead as they land at ‘SXM’. Others enjoy hanging on to the fence at the base of the runway only to be treated to jet thrusts of 747s as the spool up their engines for take off. Unfortunately, one such thrill seeker was killed yesterday when she attempted to hang on to the fence during the take off of a Caribbean Airlines 737. According to Fox News, she apparently lost her grip and was thrown from the fence, landing in such a manner that resulted in her death a short time later. Though tragic for her friends and family, I hope that the airport authorities do not over react to this and create policies that prevent people from pursuing this ‘thrill’. It’s still on my bucket list and I’m sure it’s on the list of thousands of others that enjoy this sort of thing. 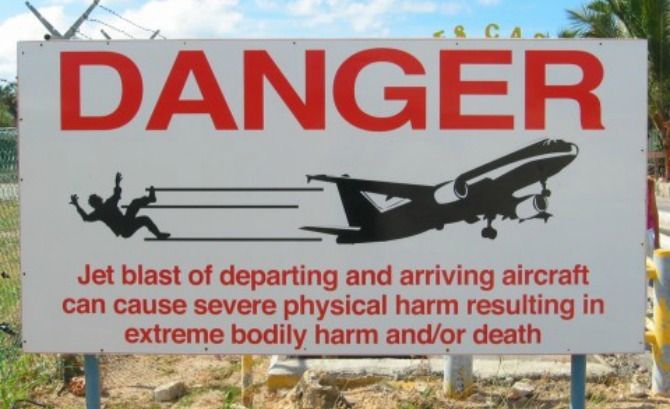 The airport and beach go to long lengths to warn visitors of the potential dangers that exist with being to close to the airport. Signs are posted along the base of the runway, and common sense can also be helpful. Hopefully the airport does not over react and ruin an ‘institution’ that has been popular with visitors for decades. Fortunately, the family of the deceased agreed that what she did was wrong and that she was aware of the risks and signage warning people about the area. Airport authorities said an investigation will take place to confirm the chain of events that lead to her death. What are your thoughts? Should the airport put measures in place to stop the thrill seekers, or allow it to continue at our own risk?